Description: Forms bright orange/red patches with no excurrent channels visible and very inconspicuous osculae. Surface has hispid appearance and is sometimes lightly silted. Patches very variable in size, from 3-20 cm maximum diameter. Habitat: Found on the sides of stable boulders in moderate to strong tidal streams at depths of 30-40m. Distribution: Currently only known from the south and east coasts of Rathlin Island, Northern Ireland. 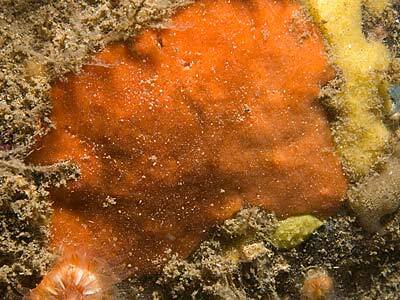 Similar Species: There are a large number of red encrusting sponges in the NE Atlantic which can only be identified with certainty from an examination of their spicules. Picton, B.E. & Morrow, C.C. (2016). Antho granditoxa Picton & Goodwin, 2007. [In] Encyclopedia of Marine Life of Britain and Ireland.